I am loving spring 2012! I see bright colours and beautiful patterns. It looks like retro is making a huge comeback. So put on your hot coral Louboutins and let’s go to the disco! Here is my second video tutorial – today we talk STYLE. Fall is one of my favourite times of the year. Aside from the beautiful orange and golden colors nature has to offer, designers are releasing their latest lineup for the season. I’ve been so excited about what I’m seeing on the runway this season I thought I’d put together a mini fashion show to share what I’m loving right now. Feeling the chills of September? It’s time to pack away the minis and embrace something a little warmer while still keeping the chic appeal intact! First up is the saturation of faux fur that we’re seeing all over this season’s runways and sported by one of our favorite fashionistas Rihanna. Like it or not, this furry look is anything but boring and it is here to stay. Faux fur vests, faux fur jackets, you name it—they’re the most sought-after items of fall 2010. They’re the hottest pieces around, literally! Remember a younger, less crazy Tom Cruise back when he was in “A Few Good Men”, rockin’ that military look? While Tom is slowing down on the “people’s choice” meter, the military trend continues to march on into the realm of popularity thanks to stars like Madonna. Burberry’s 2010 fall line has some great pieces that exemplify this silhouette. 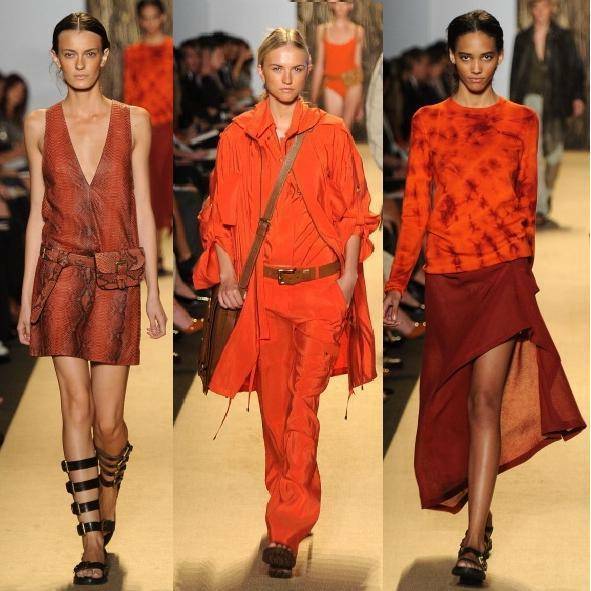 Also check out Ali Ro’s 2010 fall lineup for more dramatic looks. You can take this look up a notch by using pieces such as buttons and pins or any other military-inspired accessories. Don’t go overboard though—you want a stylish military look, not a crazy uniform. Ah, shoes…need I say more? Summer is winding down but that means as the fall season arrives, so does an amazing array of chic footwear to dress up your feet. One noticeable staple of every fall season is none other than the classic and yet bold leopard print; not only is it versatile enough to compliment any outfit, it practically is the outfit. You can play it down with a pair of skinny jeans for a casual day look or make it part of your glamorous evening look with a cocktail dress. 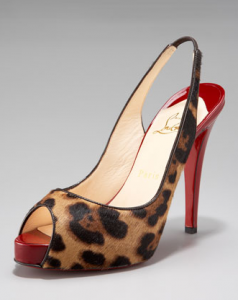 One pair that I’ve been scoping out are the Christian Louboutin – No Prive Leopard Pony Pump. So be sure to embrace the inner feline in you—a little untamed, a little dangerous, but always chic. It looks like it will be raining shades of Grey this fall. Whether it’s matte / shiny or shimmery, Grey is the subject of gossip all around! Leading this whirlwind storm of grey is none other than the icon of outrageously fabulous style: Lady Gaga! Not only is she busy headlining her Monster Ball 2010 concert tour, she’s headlining fashion news everywhere with her September issue of Vanity Fair cover where she channels another powerful revolutionary—Lady Godiva—by wearing nothing but a gorgeous head of silvery grey locks and rockin’ a spectacular matching shade of nail lacquer, one that we will be featuring at the Salon Beauty Bar. Not surprisingly, this lacquer has already sold out before the magazine has even hit the shelves! Wonderfully dubbed “Waking Up In Vegas”, this lacquer is a greige crème that hits all the right notes. Some even say it is the symbolic colour of New York. It’s chic, urban, edgy, and high-fashion, an eerily perfect description of Lady Gaga herself don’t you think? The brainchild behind this famous concotion? Deborah Lippman, who’s also the creator of “Bad Romance” (read the review by All Lacquered Up.com) —a rich, sparkly, and glamorous deep purple shade named after Lady Gaga’s popular song. Not only did Deborah create the trend-setting grey seen on Gaga’s nails as the icon strikes an alluring pose topped off with a peace sign with her hand on the oh-so-popular Vanity Fair cover, she also had the honor of painting Lady Gaga’s nails for the shoot. Can we say we’re jealous? Summer is that time of the year when your feet get the most attention, so why not show them off in their best light? Take a cue from young starlets like Miley Cyrus and Katy Perry, who have been spotted wearing the hottest trend this season on their nails—bright colours! Whether you prefer a sophisticated and yet eye-catching red or a fun and flirty yellow, just remember, it’s all about making a statement. Once you have your toes decked out in style, put on a pair of gorgeous sandals and take your fabulous feet around town! Turquoise, bright blues, baby blues, pink and orange corals are making a huge splash in 2010 and you can use them to transform your toes into accessories that speak for themselves. Here’s a tip: make these bright colours pop against your skin tone by applying one coat of white opaque nail polish first. Looking for a special shade? Chanel’s Le Vernis Nail Lacquer offers an irresistible aqua-blue that instantly brings you the delights of the tropical seas.